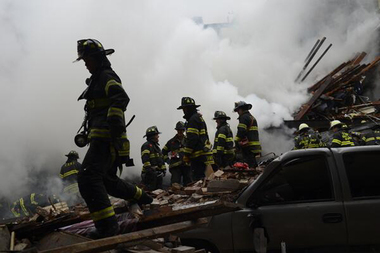 Firefighters pulled three more bodies from the rubble of an East Harlem explosion Thursday morning, officials said. EAST HARLEM — The state’s $425,000 emergency fund to help businesses recover from the East Harlem explosion is actually $335,000 — and not a single cent has been paid out. Gov. Andrew Cuomo’s office promised in August that the fund “will distribute $425,000” to help the mom-and-pop shops around the blast site get back on their feet. The press release even had a breakdown of where the money was coming from: a $100,000 grant from the Empire State Development Corp., $125,000 from the Harlem Community Development Corp., $100,000 from the Upper Manhattan Empowerment Zone and a $100,000 commitment from Assemblyman Robert Rodriguez. However, the amount currently in the fund is $90,000 short of that number, a spokeswoman for the Empire State Development Corp. said. The spokeswoman declined to give her name on the record, saying she was merely clarifying the numbers. This is the first time the full amount of the emergency fund has been publicly disclosed. ESD contributed a $100,000 grant. Rodriguez, the Upper Manhattan Empowerment Zone and the Harlem Community Development Corp. each put in $70,000. Additionally, Harlem CDC contributed a $25,000 grant, the spokeswoman said. Rodriguez's office, which has raised $70,000 of the $100,000 pledged, will continue to seek more funds, spokesman Jordan Salinger said. If it secures more money, UMEZ and Harlem CDC will match the amount, he added. The governor's office did not comment on the wording of the press release. Despite being $90,000 short of what was originally announced, the fund is still expected to cover the costs of helping the businesses that were physically damaged by the explosion, UMEZ spokesman Bob Liff said. Every business that is approved will receive funds, Liff said. However Sabrina Saadaoui, co-owner of Sahara Boutique, the only business that's been approved to receive funds via the grant, called the money "a joke," saying it doesn't cover the costs of replacing the damage to her store. Of the 20 businesses that applied, none has received emergency funds and only one $7,500 loan has been approved, DNAinfo previously reported. Sahara Boutique on East 116th Street between Park and Madison avenues, lost $15,000 of inventory and had to spend more than $10,000 on repairs, Saadaoui said. She was supposed to be given the loan Tuesday, but she said the date was pushed back to Friday. For her, the size of the fund doesn't matter since that doesn't change the fact that struggling businesses have yet to bank any of it. “It’s still a huge amount of money that nobody has been given,” she said.